Manolis works as an actor in theater, film and television since 1991, when he graduated from Veaki Drama School , the very same school where he taught Acting in 2010-11. He has worked with several of the largest Greek theater stages and organizations (National Theatre, NTNG, Athens Festival, Tehnis Theatre, National Opera, Onassis Foundation, Megaron Concert Hall, Poreia Theatre, Neos Kosmos Theatre, etc.) as well as with many important Greek and foreign theater directors, musicians, poets and orchestras, thus starring in over 50 theatrical and musical performances, such as: Rhinocerus (Beranze), Waiting for Godot (Bérenger), End Game (Klov) Zorba, the true story (Zorba), Koutrouli’s Wedding ((Strovilis), Plutus (Karion), Pericles (Simonides, Sirte), Nicaragua-315 Incident, Woyzeck (Woyzeck), Two Gods (Miguel), Backgammon (Kollias), The Lives of Others (G. Wiesler), Iphigenia in Aulis (Agamemnon), Orestes (Messenger), Hercules (Messenger), Alcestis (Death, Feris), Bacchantes(Tiresias), Ajax (Ulysses, Messenger), Taking Sides (Ch. Ronda), Los títeres de Cachiporra (Don Cristobita), Biedemann and the Fire Raisers (Schmitz), etc. For his performance in Daphnis and Chloe-Pleasuretrip, C. Grauzinis he was honored in 2007 with the “Karolos Koun” Award. 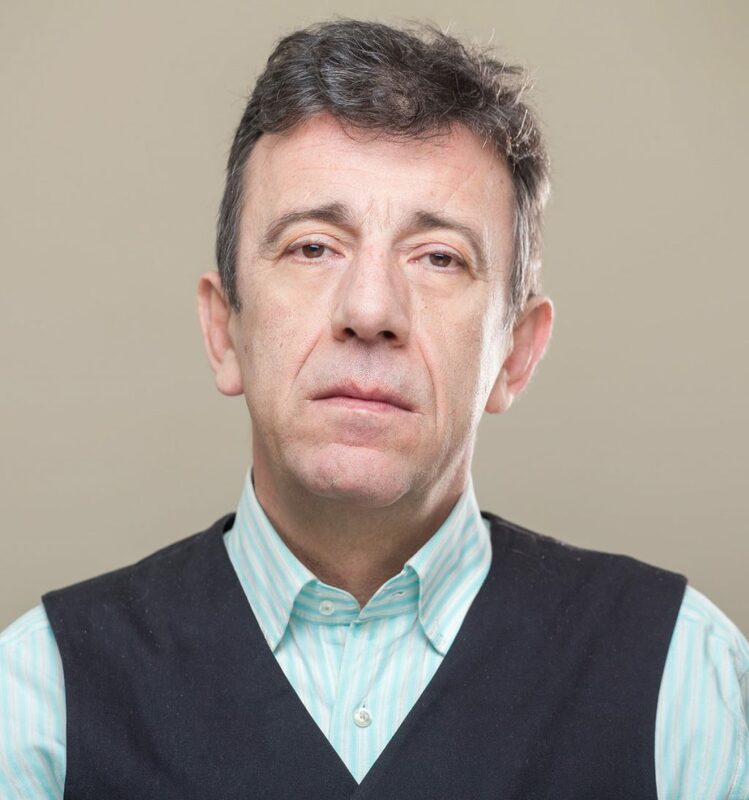 He has participated in more than 30 feature and short films with reknowned directors (Hoursoglou, Voulgaris, Panousopoulos, Tsemperopoulos and many more). He was honored at the 45th Nashville International Film Festival 2014 with the Best Actor award and at the 2015 Tehran International Urban Film Festival along with other nominations and awards in Greece. In 2014 he was honored for his contribution in the art of theater and film, at the 17th Film Festival of Olympia.